← Honeybee Food Foraging : Where? Why? How Far? 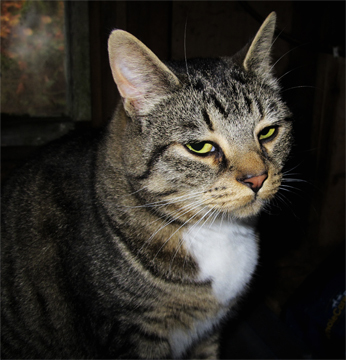 Barn Cats – I could not run the farm or the bees without them. They keep the mice out of the barn with its myriad of places for mice to live and thrive. 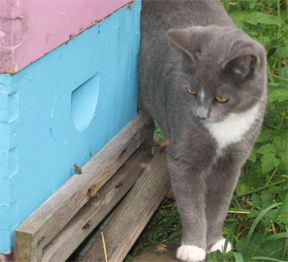 They patrol the bee yard, to help keep mice out of the hives (and keep kitties healthy with nice, fresh protein). Mice love barns and stored bee equipment, especially where they can chew and burrow into the nice insulating wax frames for winter. Mice also love beehives with bees in them.If one doesn’t get the hive mouse guards up in time, the little “darlings” slide in and make themselves at home, especially when the bees are in cluster and don’t battle as fervently. I’m happy to say it’s been years since I have seen mice at Brookfield Farm, except dead ones. I have cats; every one of them is neutered. I consider them coworkers, not pets. Some coworkers you hang out with, others you nod to in passing. 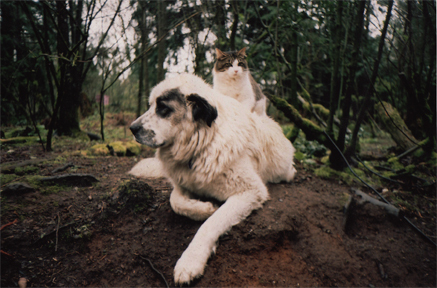 They have the large livestock guard dogs to protect them – the dogs like some of them and tolerate others. The cats also have a kibble feeder in the barn, just in case the mouse population diminishes at any time. Their home base is 24 by 40-foot barn and hayloft, but they can be seen roaming different parts of the farm. Some of the cats are sweet cats that sit on your lap, OK; they demand to sit on your lap (they are cats). Some are friendly, but not Mr. or Ms. Cuddles. On the other extreme we have the “HUMANS!!!! RUN!!! !” neutered feral cats. 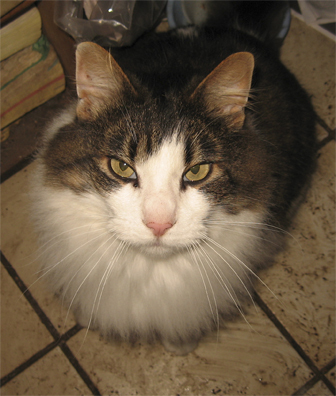 FERALS – you got to love them, even if you can’t touch them. These latter make the barn their home base. When I go into the loft, where I keep boxes, frames, and tools there is often a frantic scrambling behind the woodenware as what I call the “Stealth Family” scrambles to move to the far end of the barn before the dreaded human gets too near. The Stealths are a group of six feral rapidly growing kittens from the same litter. I picked them up at Creatures’ Comfort, a local no-kill shelter in Bellingham. I wanted kittens because we found that the older barn cats (three of them at this time) will accept kittens, but will drive away adult cats. Feral or barn kittens have the added benefit that, hopefully, their mom would have imparted survival skills to them as well as a taste for wild forage – mice. The plan seems to work. I’ve not seen live mice in ages at the farm. I do find dead mice. Happily, I do not find dead birds and our farm is filled with the trills of song birds that you can see perching on the branches of cedars, alders, and maples. Mind you, the American Bird Conservancy estimates windows in the U.S. kill up to 1 billion birds each year. Cars takeout up to 340 million birds, according to researcher Scott Loss of Oklahoma State University, who worked in conjunction with the U.S. Fish and Wildlife Service and the Smithsonian Migratory Bird Center. Cats came to live with humans over 9,000 years ago. It is assumed they showed up to eat mice, which were attracted to the grains that humans were starting to harvest and store. Humans had grains, then humans had mice, then cats ate the mice, then cats allowed themselves to hang out around people. It’s a long established relationship that kept humans’ food relatively mouse free for centuries. Sadly, like most things in life, cats represent a compromise. They kill birds, but they kill more rodents, including mice. Without cats farms would be overrun with mice. 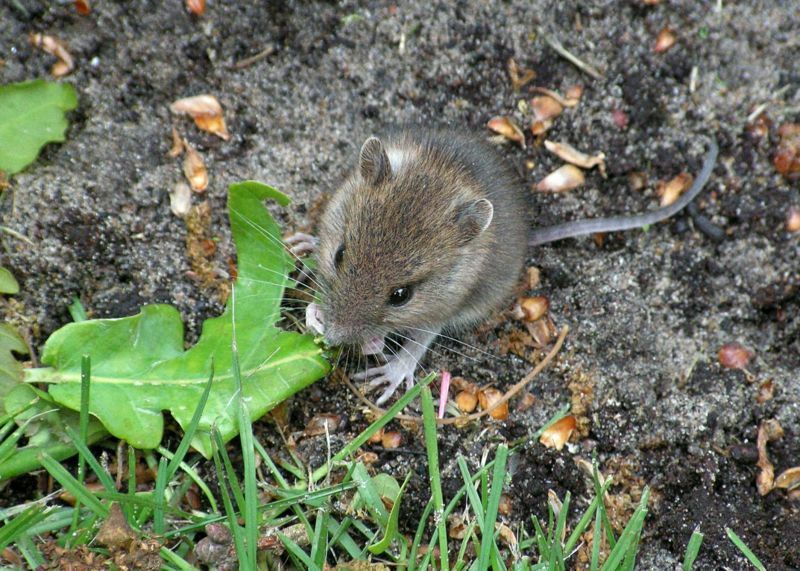 A female mouse can produce up to 60 babies a year. Each mouse is destruction on tiny feet. In Nebraska alone, it is estimated that mice cause 20 million dollars in damage every year to feeds and buildings. 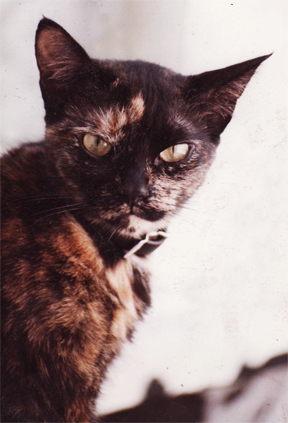 An alternative to cats is poisons – that alternative I cannot abide. The main poison is warfarin, which stops the blood from clotting. A slow death that can take 24 to 48 hours. Other animals can also eat the poison with disastrous results. . At least with cats the mice have a chance and death comes more quickly. I like cats. I don’t like poisons. Full name: Existential Angst – named for a spoken line a film I shot a long time ago. Went from alleys to rural foothills to the farm – a tough lady. There have been many over the last 25 years we’ve been at Brookfield Farm – all good workers, all loved, and all indispensable to being able to farm and keep bees. Plus I learned how to play Mack The Knife on the Ukulele. He never appreciated it – cats, what can I say. That’s the news from Brookfield Farm Bees And Honey, Maple Falls Washington – In the world of bees and honey: the bees pop out periodically in this very odd winter here (47F! in January), look around realize nothing’s in bloom and head back in. Honey: We’re now at Seattle’s Fremont Market and Ballard Farmers Market every Sunday – if you’re in Seattle, stop on by. 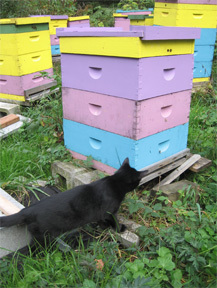 This entry was posted in Beekeeping, Brookfield Farm Bee Yards and tagged barn, beekeepers' cats, Beekeeping, Brookfield Farm, cats, hive, Maple Falls, protection, Washington. Bookmark the permalink.